Apr 30, 2018 in "Pandora Utility Suit"
The Pandora Utility Suit made its official debut at Disney's Animal Kingdom last week on Earth Day, and we've got a look at it in action at Pandora - The World of Avatar. Developed by the Pandora Conservation Initiative, the 10ft tall Pandora Utility Suit is piloted by a PCI scientist, who uses the suit to travel through the Valley of Mo'ara to study the Pandoran plants and fauna. During the travels, the pilot takes time to talk to guests and educates them on some of the details of Pandora. During its opening week there were two shows per day at 9:45am and 11:45am, but the latest schedules are varying. So if you want to see the suit in action, try to get to Pandora early and wait near Pongu Pongu in the far corner of Pandora. 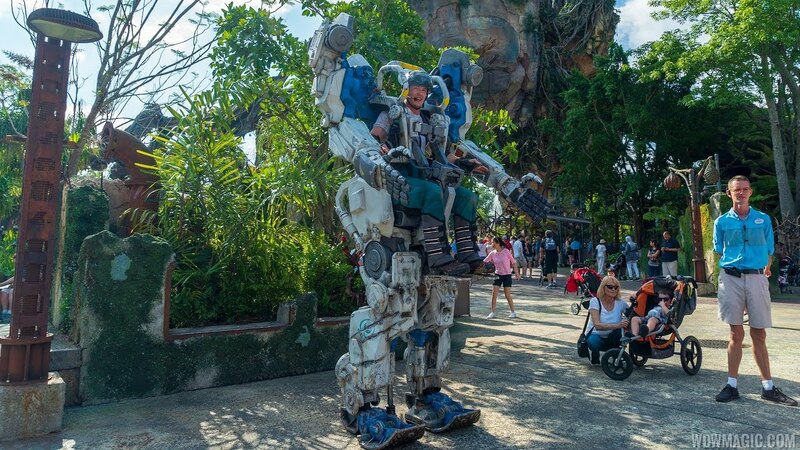 Check out the gallery for more pictures of the Pandora Utility Suit at Disney's Animal Kingdom. More from "Pandora Utility Suit"